In this article we will identify and review our top 20 overview of the best Customer Service Software. But first, a little background information on this type of software. There are a few different types of customer service software out there, but one thing that they all have in common is that they offer a single, unified platform where you can monitor and communicate with customers across multiple channels. These tools are capable of converting emails, social media messages, questions from live chat and even phone calls to tickets and notifications, which can then be routed to the right person for immediate resolution. Let’s take a closer look at our top 20 customer service software, starting with HelpDesk software. Helpdesk software is ideal for keeping track of customer conversations across various channels in one place. In fact, this type of software has become a very important part of modern business platforms as these tools integrate CRM solutions, ensuring productivity and efficiency. Additionally, thanks to automation, helpdesk software can make managing a heavy workload much easier nowadays. FreshDesk is one of the best customer service software with rich features and affordable pricing. 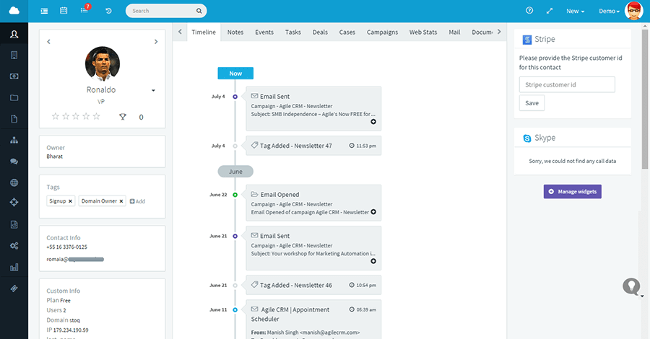 It lets you combine and manage multiple channels (wherever your customers are) on a single platform and enables teams to work together to resolve customers’ issues. You can also automate repetitive helpdesk tasks and enhance your team’s productivity through automation features like intelligent ticket assignment and event-triggered automation. It also supports full customization, self-service knowledge base, and 21-day free trial. 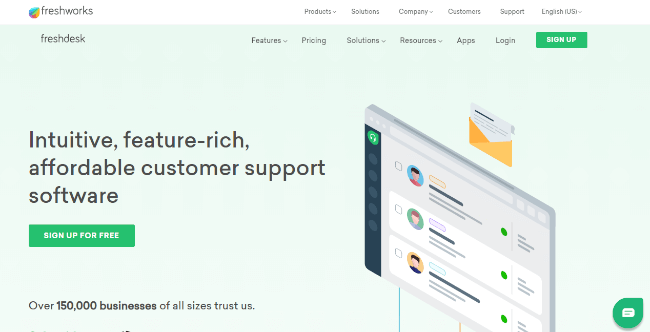 Zendesk Support seamlessly puts all your customer interactions across multiple channels in one place and supports up to 300+ brands, products, service tiers, or regions. Its ticket management is also multilingual with its admin interface available in over 40 languages. Besides, if your company offers Service-Level Agreement (SLA) to your customers, its SLA views easily lets your agents see customers’ SLA statuses and avoid serious breaches. However, this software does not come with knowledge base and self service; you need to pay more if you want this feature. Kayako offers a powerful customer support software and platform to its Growth and Scale subscribers. One of its awesome features is that you can easily see visualized views of all your customers’ journeys and interactions to offer personalized customer service to customers. Going a step further, it also lets you integrate customer data and activities into the platform for context from more than 650+ apps such as Slack, Salesforce, and Zapier. It also comes with self service support, automation, workflows, and insights. LiveAgent is one of the most well-known customer service software that is best catered to small and growing businesses. It offers 14-day trial with full features that comes with ticketing, live chat support, cloud call center, and many more advanced features. Another cool thing about the software is that it also comes in iOS and Android apps that make mobile communications easy and efficient. Additionally, you can also monitor and manage your social media such as Facebook and Twitter right on the platform. ngDesk markets itself as ‘free, cloud-based customer support software’. The software combines an easy-to-use ticket management system with ngDesk Pager — an automated incident alerting. Aspiring to offer an all-in-one solution, the company will soon add Live Chat, Phone, and CRM solutions, all for free. Like most customer software, it’s fully customizable and offers data-driven insights into your customers and agents. 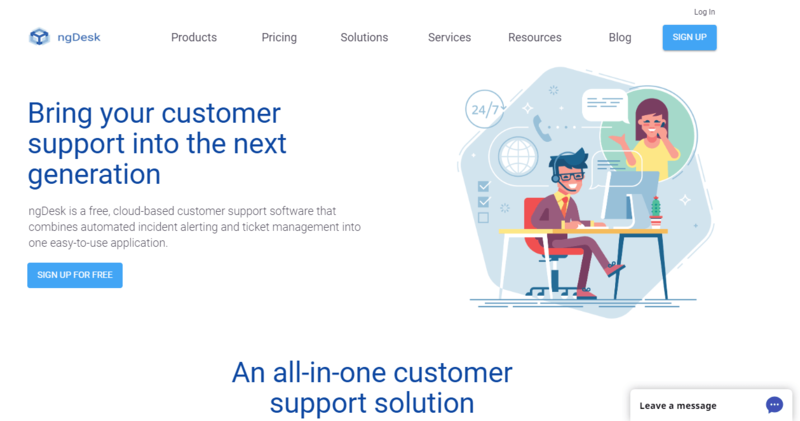 HelpSpot is another all-in-one customer service software that has everything one expects: ticket management, automation, customer self service portal, and real time reporting. Its powerful ticket management automatically converts email, phone call, forms, and APIs into tickets. Besides, every ticket has a clear ownership to avoid conflict and confusion. The software is also directly integrated with Thermostat (HelpSpot’s sister product) for you to create, manage, and send customer satisfaction surveys. Its biggest bummer is its exorbitant prices. Pricing: Free: $0 (up to 3 agents), Paid plans starting at $599 per year for 5 agents (prices increase as agents increase). 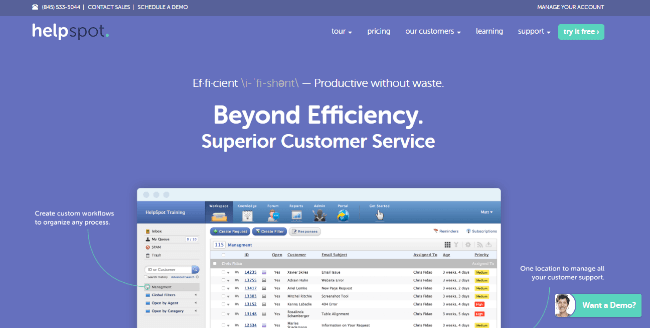 Known for its web-based office suite, Zoho also offers full-fledged customer service software called ZohoDesk. It comes with Zia — its artificial intelligence — to assist your customer service team. For instance, Zia can show agents relevant responses to customers’ questions directly from the knowledge base you created to let customers help themselves in the first place. Your customers can also speak or chat with Zia directly on your website or mobile apps, and Zia will respond based on the knowledge base. AI aside, ZohoDesk provides insights into your customer service team, customization, and security. AzureDesk is one of the most affordable customer service software that comes complete with ticket management and self service portal. It converts support emails into tickets and supports unlimited mailbox. You can also create groups of team members and assign tickets to a whole group. 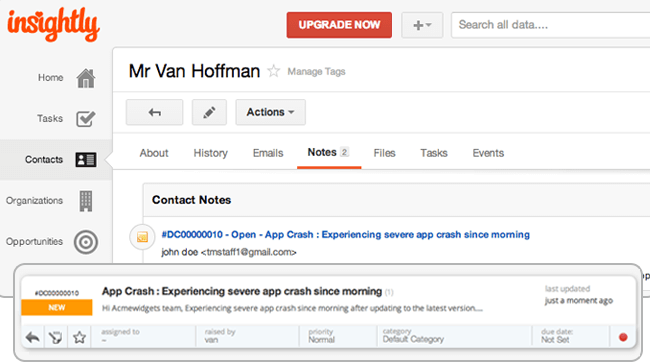 Conveniently, your team can chat and collaborate on issues using Private Notes and Internal Tags. CRM software now lies at the heart of most marketing and sales operations. These businesses are trying to avoid silos and make information available to their employees wherever they are. Plus it’s proven to be an efficient way of obtaining the much sought-after ‘360 degree view of the customer’. Let’s take a look at a few of these software below. SalesForce is perhaps one of the biggest and most widely used CRM software on the market. 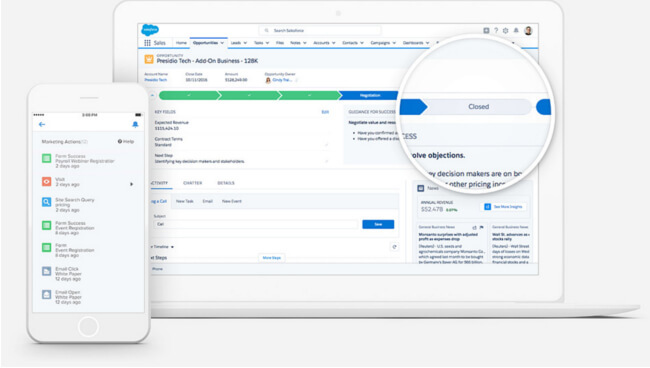 Luckily for smaller business, SalesForce offers a basic edition called Lightning Essentials. 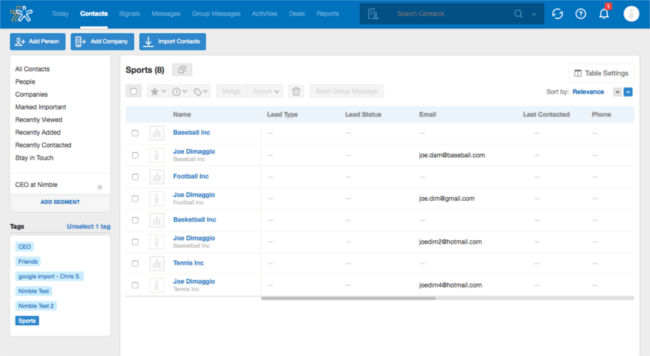 This package provides the user with an advanced contact manager that includes email integration and follow-up reminders. It also includes a lot of options for integration and customisation. Pricing: Lightning Essentials package ($25/month/user), Lightning Professional ($75/month/user), and more. 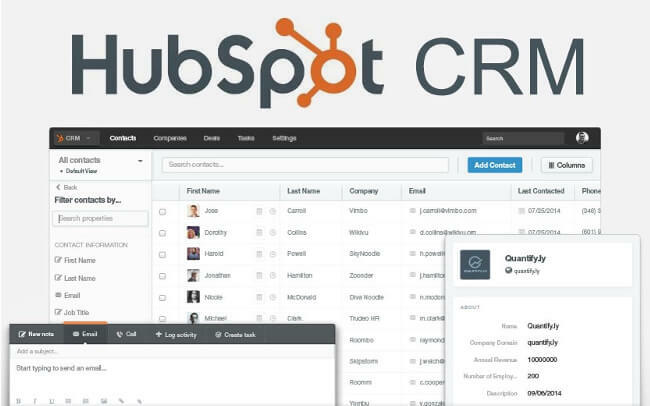 HubSpot offers a completely free version of its CRM software that is rather popular among small businesses. The software includes all of the basic features provided by CRM software, allowing you to keep track of your company’s activities, including contacts and company profiles, assigning & tracking deals, and managing all of that data in a detailed dashboard (visible to all team members). Already a HubSpot Sales user? Then you can also use this CRM software to boost your inbound sales. Not to mention, HubSpot offers several integration options with popular apps like SalesForce, Shopify and Microsoft Dynamics. In addition to powerful marketing automation and email tools, Infusionsoft also has its own CRM and customer service software. This software allows users to manage tags, set lead scores and build email subscriber profiles. All of your data can be accessed from a number of different devices (such as your tablet or smartphone) and is also very secure. This system is also nice in that it keeps a record of all customer interactions. Pricing: Basic Package ($199/month), Pro Package ($299/month) and Premier Package ($399/month). Insightly is CRM software that is one of the top-voted choices among smaller businesses. This is probably because its user interface is very easy to navigate and customisation & integration options are plentiful. Insightly also includes various project management features such as task management and tracking. Pitfall: it does not provide custom reports or dashboards and is really only convenient for SMBs. Agile CRM is a particularly interesting CRM software in that it offers a lot of those big business features like custom appointments, drag-and-drop marketing automation and reports via email. This software also supports widgets, a large library of plugins, API-powered integrations and more. The free version, however, is quite limited in terms of features offered. Pricing: Free for up to 10 users, or choose the Starter package ($14.99/user/month). Nimble CRM is a great CRM software for those of you looking to combine contacts, email and social media interactions (works great with Twitter) in one place. The interface is also very easy to use in that it provides you with a to-do list, shows you top / key deals and more. It’s also got this cool ‘rules engine’ that helps Nimble predict relevant contacts & activities based on your user behaviour. Users can set reminders to Stay in Touch with certain users as well as mark certain communications as important to stay ahead of the game. Pricing: Ranges from $9/user/month to $19/user/month. 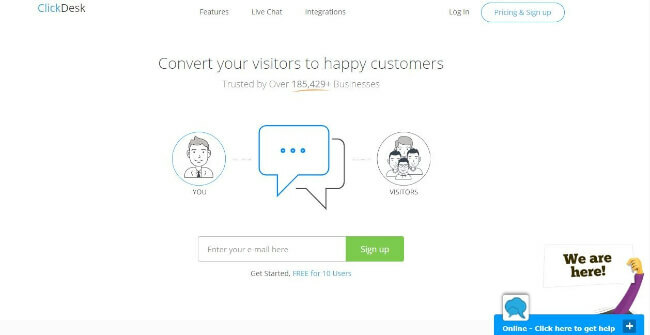 Live chat software is a way for your business to engage with online visitors, by initiating conversation with new visitors, interacting with returning customers and supporting existing users in real-time. From users’ perspective, these types of tools are recognised as those small, pop-up chat boxes that can often be spotted on the bottom right of websites. From a business perspective, they are often seen as a convenient way of communicating one-on-one with your website visitors – on their terms. 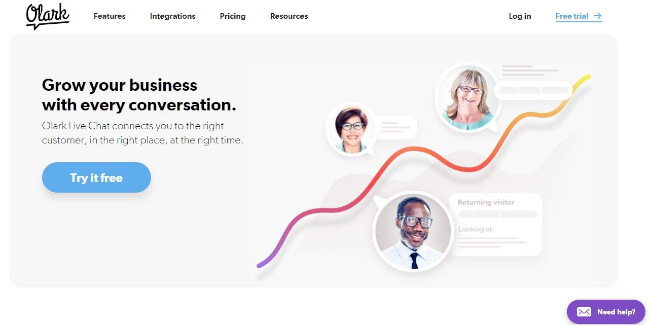 LiveChat is a clean and easy-to-use live chat software that boasts PayPal, IKEA, Huawei, and more big corporations as clients. It allows you to seamlessly integrate more than 130 popular tools such as Salesforce, Messenger, and Shopify. If you’re not sure if it’s right for you, you can always start with 30 days free trial with Team features. One cool thing about LiveChat is that, unlike most that charge per agent, it charges per seat and multiple agents can share one seat. Olark is another live chat software that is easily customisable and features automation. You can easily customise your live chat to reflect your brand. Its automation features automatically send greetings and custom messages to customers based on their behavior and route conversations to the right team. Another great thing about Olark is that you can instantly retrieve insights and data from all of the live chat transcripts searchable on the platform. It also features 2-week free trial, pre-chat survey, and chat ratings. SnapEngage is more than your typical live chat software; beyond website’s live chat, it lets you manage all the chats from multiple channels such as WeChat and Messenger all in one place. Besides, it supports seamless integration with popular CRM tools to offer an enhanced and unified experience. Also, if your customer leaves an email address, its Social Discovery feature automatically finds his/her social media profiles for you. However, one of the drawbacks of SnapEngage is that it requires a minimum of 3 users to sign up its Essentials and Professional plans. 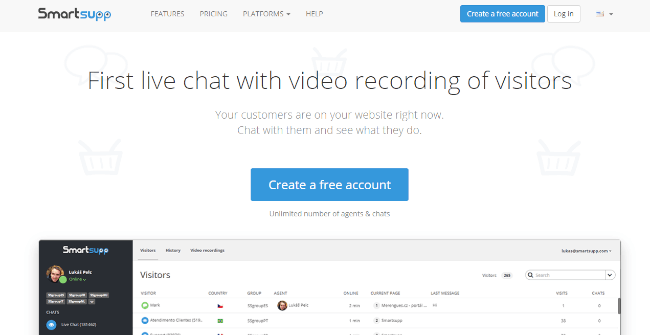 ClickDesk is one of the few live chat software that supports voice and video functions. Beyond text-based live chat, agents can have voice or video calls with customers via Google Talks and Skype. Like most live chat software, it integrates smoothly with various popular third party platforms and services such as WordPress and MailChimp. For issues that can’t be solved with live chat, you can leverage its helpdesk platform that is well-integrated. One unique feature of ClickDesk is that it lets you add a social media toolbar (Twitter, Facebook) to chat box and increase social media engagement. Tidio is one of the few live chat software that offers attractive ‘forever free’ plan that includes 3 agents and unlimited chats. It’s also available on PC, Mac, iOS, and Android. For multilingual websites, Tidio is one of the best options because of its multilingual chat setup. You can also use bots to automate simple yet engaging custom responses to visitors. To stay ahead of Tidio and Pure Chat, Smartsupp goes as far as offering a ‘free forever’ plan that boasts unlimited chat and unlimited agents. But ‘free forever’ plan users only have 14-day chat history. It’s worth pointing out that its paid plans are actually affordable. And paid users get access to its Smartlook video recordings of visitors (mouse movements and clicks) for insights into visitor behavior. Paid users can also use Google Analytics to track the software’s impact on conversion rates. All in all, those are our top 20 customer service software for you to level up your customer service and offer the kind of customer service your customers want. And don’t just provide great customer service; you should also make use of data and insights generated by the software to improve your customer service, agents, knowledge base, and products and services.